Â Â Â Thanks to our local affiliates who made the Affiliations table at Smithsonian Teachers’ Night such a smashing success! !Â Over 1600 teachers attended Friday night’s event (October 20), and Affiliations staffÂ could hardly keep up with their zeal for materials! We also had a nice smattering of science, with field trip information from the Virginia Museum of Natural History and school tours and programs from the National Museum of Dentistry. Mental note for next time – any giveaway (in this case, apple-shaped stress balls from the Reginald Lewis Museum) will go faster than any other thing on the table, so bring twice as many as you think you’ll need! Every quarter, educators from across the Smitsonian meet for an “exchange” of ideas around a common topic of interest. 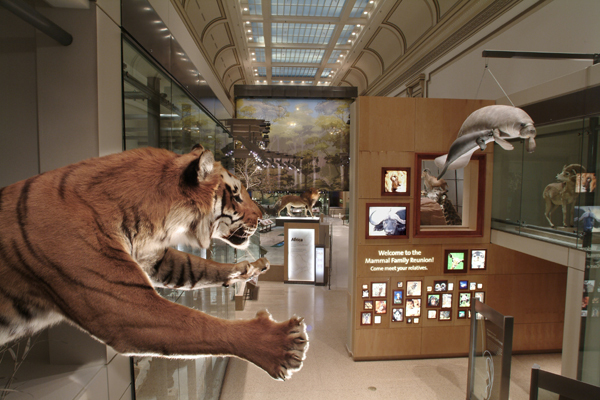 Last week I attended my first educators’ exchange, where we deconstructed the National Museum of Natural History’s Mammal Hall. We were trying out the theories of Beverly Serrell, whose new book, Judging Exhibitions: A Framework for Assessing Excellence provided parameters, criteria, and a scoring system. While this may sound a little formulaic (an exhibition is not an algebra problem after all), in practice of course, it is not – we discovered wildly varied responses to the same stimuli. Some of my collegues came away knowing more about the basics of being a mammal than they ever had, while others found the display somewhat too textbook-like. And so on. It was worthwhile and enjoyable to me though, to subject an exhibition to these questions, even if we can’t agree on the results. 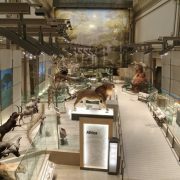 I was forced to confront my “meaning of life” -type questions of why I go to museums in the first place, and what do I expect from them? What are my core values in spending my time this way? Ok, Museum 101. But aren’t these questions worth re-asking ourselves, and our exhibition teams, from time to time? I do want an exhibition to challenge my thinking. Going with very simple ideas is ok, unless they are simple to a fault. I find successful interactives to be those that redirect my focus back to critical observation of objects to illuminate a point (that I could otherwise read in a book.) Low-tech (crawling under a tree trunk to see how squirrels live) is as, if not more, effective than computers and video. No, you can’t please every audience demographic. But little gestures to those outside the core target audience are significant and not difficult. Do you agree or are your values different? My favorite comment was about majesty. To hear Smithsonian scientists talk about their work is to hear inspiration; they are professionals who truly love what they do. Translating passion into physical space is a lofty goal for which any exhibition should strive. 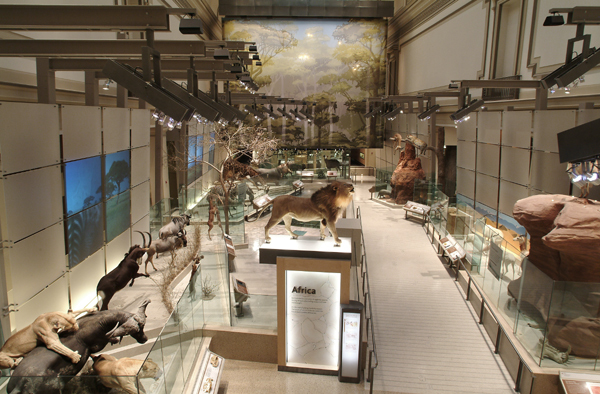 That the Hall of Mammals achieved a level of majesty, a passionate spectacular majesty, is something on which we all could agree. Who better (literally) to drive tourists and visitors to your Museum than your city’s taxi drivers?Â The Smithsonian’s American Art and Portrait Gallery recently staged an event for Washington’s cabbies – Abe Lincoln, Marilyn Monroe and other icons represented in the Museums’ collection gave outÂ free doughnuts, branded coffee mugs, and museum information to all the cabs that drove by one morning last week.Â (Read more about the event on SAAM’s blog, Eye Level). Not only might cab drivers better remember the Museum’s hours and location, they will also have a fun story to tell every passenger that wants to go there. 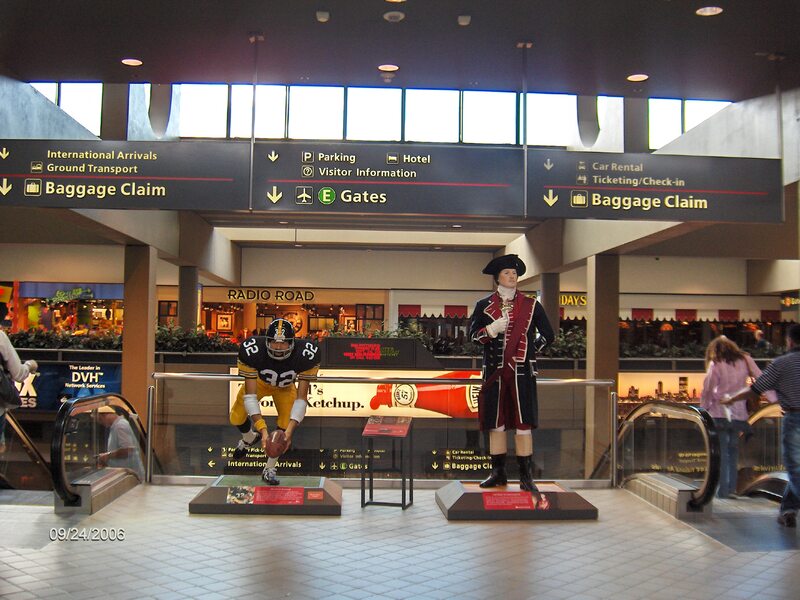 Â Â If you’ve ever beenÂ through Pittsburgh’s airport, it’s likely you passed this pair;Â everyone doesÂ on their way to baggage claim.Â Who are they?Â A young, 20-something George Washington, and SteelerÂ football player Franco Harris.Â Â The two icons of Pittsburgh history are accompanied by signage invitingÂ arriving passengers to “relive a few classic battles” – when George WashingtonÂ stormed into the area in what was to become the French and Indian War;Â and Harris’ Immaculate Reception that won the Steelers’ 1972 playoff game against the Oakland Raiders.Â Â It’s a curiosity that’s hard to avoid, and one thatÂ simultaneously invites you to experience more interesting stories at the Senator John Heinz Pittsburgh Regional History Center, aÂ Smithsonian affiliate.